To create new documents, you first need to add a new output document node. This node is used to group pages and sections together into documents. Each output document has one or more page or section child nodes that constitute the content of the document. Read the following section to learn more about the options of output documents. Once you have opened a new project, you can add a new output document. You do this by clicking on Output document in the insert toolbar. When a new output document is added, you need to specify its properties, found on the right side of the screen. The first to specify is the export method, used to export the completed document to a user specified location in a user specified manner. Read more about this in the export methods section. Most of the export methods support the conversion of the standard PDF document to other formats. This is useful for long term archiving, accessing other viewers etc. To convert a document to another (file) format, choose the file format directly below the export method settings. Do not forget to change the extension of the file name of the output document. Besides the export method, there are also document properties that can be defined as well. For instance, you can choose to give your document a title or to acknowledge the author. You can find this when you click on the tab Document properties underneath the export method properties, next to the Export method tab. This may resolve to “Orders of Magic Inc. in July 2004” if month and year are specified as merge parameters and customers refers to the result of a SQL query and name is a field in the result of the query. 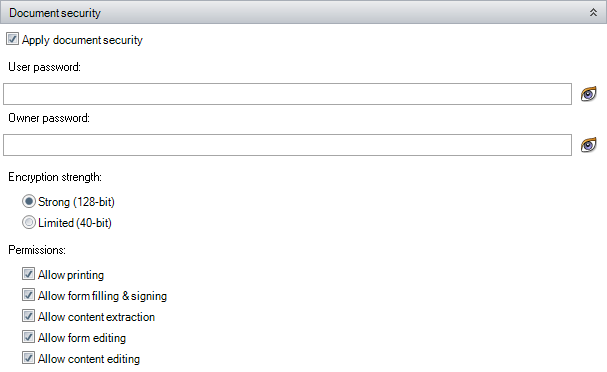 You can add security settings to your merged documents by selecting the Apply document security checkbox. This feature is only available for applicable output methods. The User password allows users to open the document, but not to change the security sections. The Owner password can be thought of as the “master” password. This password allows the user to make security setting changes. Encryption strength allows you to specify whether to use Strong (128-bit) or Limited (40-bit) encryption methods. 128-bit security offers 88 additional bits of key strength, and is much harder to “crack” than 40-bit. Under Permissions, select the access rights for the user. By default, all permissions are allowed.